After first blush, Angie isn’t very happy. 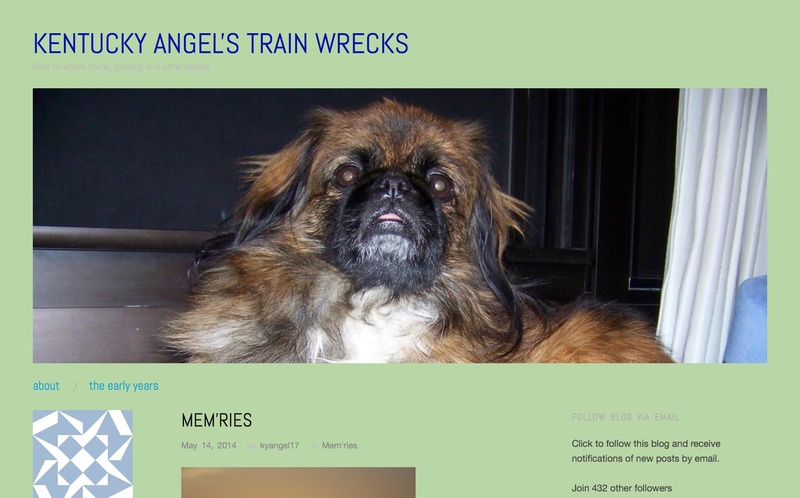 Something is amiss, in Kentucky, where 72-year-old Angie again can’t deliver to the world her Kentucky Angel’s Train Wrecks blog, and where ever the folks sit and punch in the directives that try to make us in this quite large WordPress world happy. Angie is the fighter who battles MS from the mobility chair that allow her best access through her senior living apartment complex and her city of Owensboro. Her computer has given her problems, but she’s kept her head down and started several different versions of her blog when she found that she couldn’t log on to WordPress again. The last time, I made her swear to me that she would not try to change her WordPress password for security reasons. That shouldn’t cause a problem in a perfect world, but that’s not where we live, as we know. As we traded emails in this blog friendship we’ve developed in the last half year, I thought maybe the problem was solved this time. And then a week ago today, her computer got struck by lightning. Over the holiday weekend, she sent me an email from her new computer. Angie being Angie, she started off by saying she was damn glad she wasn’t attached to it when it got hit by that lightning bolt. Her son had taken her shopping, she continued. The new setup has Windows 8. She’s figuring it out. But she had to change her WordPress password. And her blog won’t work. The WordPress friendship engineers are just frustrating her, telling her the email addresses she’s entering are already taken. Of course, she writes to me. They’re taken by her old blogs. And so, today, I sit and write to WordPress this simple plea. Please get Angie blogging again. Get your best listener to send her an email, please. Maybe your happiness engineer who has a 72-year-old grandmother who blogs? I know you have her contact emails. She says she now has many. She’s written to me from several. Angie thinks we should start a petition, fellow bloggers. She’s angry, you know? I hope if the statement “Please get Angie blogging again” gets mentioned in enough comments, reblogs and the like, perhaps WP shall take notice. How frustrating this must be for her–the modern world is not without its challenges, that’s for certain. She’s as sharp as you and I put together, Michael. I can’t figure out what her computer problem is, that’s for sure. Come on, WordPress, take that one more step. What? I cannot believe this…and I can’t do anything off the phone today Internet-wise. I know, right, Jeanette? All it will take is one really good and thorough email thread that starts with the knowledge of what I just said above. Or a phone call with Angie also on her computer. Please, WordPress. AGAIN!??? Oh poor Angie. How is this happening???? Please, WordPress, figure out why this is happening to Angie’s account. Wow. Really. This is just awful for Angie. What the heck? I’m wondering if her account was hacked or something on WordPress’s end. It’s is quite baffling. Please, WordPress, help Angie get back to her blog. There should be someone at WordPress to help her, where are they? That is the question of the day, Dora. Where are you, WordPress? Right?! Lightning, now. What else? Thanks, Audrey. I feel horrible for her. Gotta get her the blog back and running. It is a mess, Mark. Angie is going to try again, Audrey. I feel terrible she is dealing with think I know it can’t be good for her MS. Shoot her an email with my email peacelovegreatcountrymusic@yahoo.com and I will commit to getting it figured out. I’ve never had any issues with the Happiness Engineers and I’m sorry they aren’t jumping in and helping her resolve this. PLEASE WORDPRESS GET ANGIE’s BLOG WORKING FOR HER!!!!! She loves WORDPRESS! Why not show her a little love back????? That’s exactly what we need to happen, Colleen. Thank you! See that, WordPress?! WordPress we love you…..please answer our plea!!!! Peace Love Great Country Music is also trying to help Angie via email. We shall see if that helps, Colleen. So far, though, no WordPress help. Grumble. I hope PLGCM can help! What way can we get to WordPress peeps to help? I’ve only had to use ‘help’ on one or two occasions and both within a very short time of one another. They did help. But my problems were not this large. I am like you, Colleen. The few times I had a question, I called up the help page by Googling it, typed in my question, and received a quick reply. The first time Angie got lost in (cyber)space, I sent them a note about that, too. I do not know why she is having a problem. It may be complex and confusing with codes and such. I just don’t know. It has been a long day since I responded to you Mark, has there been any progress or contact? I’m just now getting to my comments and have about twenty blogs ready to read. So I’m not sure if I’m up to date on any recent developments. There is no final news to report yet, Colleen. Both PLGCM and I have been in email contact with Angie today to talk about the situation. I hope wordpress find a way to sort this. There must be a solution. we are out here wordpress and angie is left out in cyberspace, just floating. please help get her back in the wp orbit. Peace Love Great Country Music emailed with Angie, and Angie put a theme outline up for a new blog. I saw it tonight. So, although I don’t think WordPress helped restore anything, she’s going to start ANOTHER blog, Beth. Wow, I say. I could imagine how frustrating it would be for a 72 year old woman trying to muddle through the WP maze. It’s frustrating to me and I have almost twenty years to 72. Angie is an amazing person with much to share from her challenging life. And is is wonderfully funny in the telling. You will feel from her writing that you are sitting at her kitchen table sharing stories and cup of coffee. Please Word Press, help her out!